Depending on the compounds they produce when metabolized, all foods — with the exception of pure water — are either acid-forming or alkaline-forming in the body. Consequently, each food you eat has a temporary and minuscule effect on your body's pH balance. Alkaline-forming foods support your body's natural homeostasis and contribute to critical alkali reserves. When over-consumed, acid-forming foods deplete alkali reserves and ultimately tilt your body pH away from its naturally alkaline state toward acidity. The potato is a low-acid, alkaline-forming food — depending on how you prepare it. The organic acid content of nearly all foods is high enough to give them acidic values on the pH scale, which runs from 0 to 14. Pure water has a value of 7, and is neutral. Foods with pH values below 7 are acidic, while those valued above 7 are basic, or alkaline. Acidic foods are divided into two categories: high-acid foods, or those with values lower than 4.6; and low-acid foods, or those with values between 4.6 and 6.9. Potatoes, like the majority of vegetables, are a low-acid food with a pH value of 6.1. Compared to potatoes, asparagus is as acidic, sweet potatoes are slightly more acidic and peas are slightly less acidic. A food's pH value isn't indicative of its pH nature in the body. While nearly all vegetables have slightly acidic pH values, most are alkaline-forming in the body. This is because the metabolic process changes the nature of some of the food's compounds as it is broken down. Many fruits and vegetables contain potassium citrate, for example, which becomes potassium bicarbonate, a highly alkalizing compound, when metabolized. According to "The Acid Alkaline Food Guide," potatoes are moderately alkaline-forming in the body. Baked potatoes, including the skins, are the most alkalizing, followed by mashed potatoes prepared with milk and butter. Homemade fried potatoes are slightly alkaline-forming, while most fast food fries are highly acid-forming. Cells and tissues require a slightly alkaline environment to function properly. Alkaline-forming foods include herbal teas, mineral water, most vegetables, herbs, fruits and spices, and some grains, legumes and nuts. When you consume acid-forming foods, including sugar-containing foods and beverages, dairy products, alcohol, coffee, meat, poultry, fish and most grains, nuts and legumes, your body must buffer and remove the acidic residues to maintain homeostasis. A diet emphasizing acid-forming foods can lead to acid buildup in your tissues, because the body has a limited daily capacity for the buffering and removal of acids. Continued acid buildup can result in chronic low-grade metabolic acidosis, a condition marked by a slightly acidic body pH. According to "The Acid Alkaline Food Guide," metabolic acidosis sets the stage for numerous conditions and diseases, including cancer, chronic fatigue and inflammation. Pesticides diminish the alkalizing potential of all foods. To obtain the most nutrition and alkalizing potential from potatoes, buy organic and consume the skin, rather than peeling the skins off of conventional varieties. 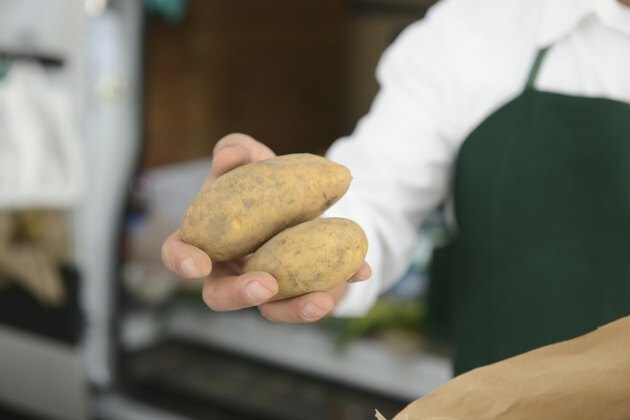 An organic baked potato seasoned with parsley, sea salt and chives is far more alkaline-forming in the body than a conventional baked potato topped with butter, sour cream or cheese. Sea salt, vegetable salt and parsley are highly alkaline-forming in the body, as are most herbs and spices. Olive oil is another alkalizing food you can use in place of butter for added flavor and richness. Butter, sour cream and cheese, however, are acid-forming foods. Cottage cheese is also slightly acid-forming, but contains fewer calories and is generally considered a healthier topping.